Dipping – "Expertise, Right Across the Board"
Dip coating is a traditional conformal coating application method that has been used to conformal coat circuit boards for a very long time. The printed circuit board (PCB) is dipped into a tank of conformal coating liquid. This can be complete submersion or partial dip. The board can be dipped vertically, horizontally or at another angle. The board can be dipped manually or automatically. The board is removed from the coating and the excess coating drains away. This leaves a conformal coated circuit board. What equipment do you need for dip coating? Is dip conformal coating a batch or inline process? Which conformal coatings can be used in a dip process? Is dip conformal coating a low, medium or high volume technique? How cost effective is the dip coating process? What variables control the quality of the conformal coating finish in dip coating? What are five advantages of the dip conformal coating process? What are the five disadvantages of the dip coating process? In its simplest form, a board can be dipped by hand into a container of conformal coating. However, normally dip coating equipment is used. This is especially true if medium and high volume processing is required. This is because the process variables are controlled by the machine. These factors, plus the viscosity of the coating, are important to create a high quality finish and reduce costs. Dip coating is normally a very simple process for operators to use, since the systems tend to be automated and set up to run automatically. It is possible to hand dip conformal coating. However, the cost of labour due to individually processing, plus the lower quality of finish associated with hand processing, tend to limit this to a low volume process. Conformal coating dip production can be both a batch or inline process. At a simple level a set of PCBs can be hung on a batch dip system. The circuits dipped in the coating. The operator removes them from the machine by hand ready to be dried in another area. For an inline system, the boards can be manually or automatically loaded onto an inline system. The conformal coating dip machine can continuously coat and dry the boards. 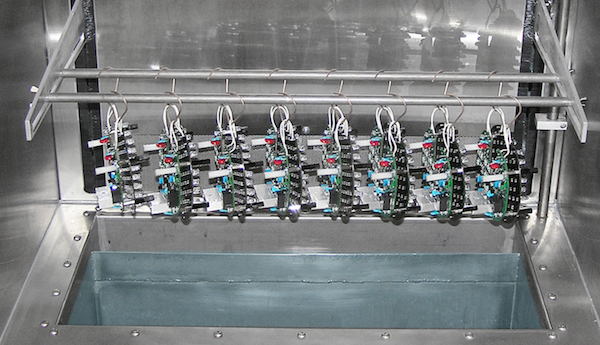 The inline conformal coating dip machine creates a very high speed, low cost process. It can be stated that all conformal coatings can be dipped. However, the practical nature of the process can lead to certain coatings being unsuitable. For example, solvent based conformal coatings like acrylics and urethanes are perfect for dipping. They are perfectly suited to remain in a dip tank for long periods of time without degradation. However, coatings that cure in moisture or degrade with time due to a pot life can be a problem. Materials like UV cure coatings would need the light shielded from the tank to prevent premature curing. Coatings that cure with moisture or UV light would need to be protected from the external environment to prevent premature cure and excessive waste. Finally, two part materials do not lend themselves easily to dip coating, especially in high volumes, due to the likelihood of high wastage of coating materials. Dip coating is a highly repeatable high volume process. It is also one of the fastest application techniques. This is because it is possible to dip multiple PCBs in one cycle. The conformal coating technique also coats both sides of a board at once. If the printed circuit board (PCB) is designed correctly, it can be the highest volume technique. It also lends itself to low and medium volume application very easily. However, if there can be a lot of hand masking involved before the dipping application. If there is a lot of masking then this can make the coating process highly costly and the speed of process completely dominated by the preparation process. The coating process itself can be extremely low cost. The cost of a dip system is low compared to many other processes and when balanced against the speed of application. However, if the circuit board demands a lot of components be masked before processing then the overall coating process can be expensive. Masking for dipping can be very demanding and very difficult to complete successfully. Viscosity of the conformal coating: The viscosity and the withdrawal speed of the circuit define the coating thickness of the dry film on the circuit. Reduce the viscosity of the coating and you lower the film thickness on the circuit. Speed of Immersion of the Circuit Board into the Conformal Coating:Immersing the board too quickly can trap air underneath components. By reducing the immersion speed it is possible to allow the conformal coating to penetrate under devices by surface tension effects. Dwell Time of the Circuit Board in the Conformal Coating: The dwell time can influence the coating under components. Allowing the board to sit in the coating for a small period of time (5-30s) may allow better penetration of the conformal coating under devices. Withdrawal Speed of the Board From the Conformal Coating: Increase the withdrawal speed of the circuit and you increase the coating thickness. this is counter intuitive to what is expected. 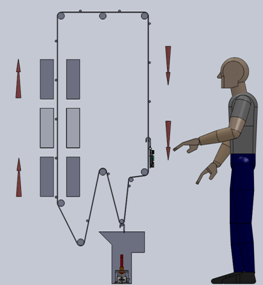 Critical Process Controls: The viscosity and the withdrawal speed are the critical process variables. Varying these two factors allows variation in coating thickness. Dipping is a high-speed conformal coating process. Both sides can be conformal coated simultaneously. The dip coating process requires less operator skill. The cost of masking can make this a highly costly process. The masking needs to be perfect. Many PCBs are completely unsuitable for dipping due to cost of processing. The issue of “thin tip coverage” is important. Achieving a good coating thickness can sometimes be difficult.